Vitex2 Memory Foam Pillow Giveaway! Every Mom needs one thing, and that is a GOOD NIGHT'S SLEEP!! 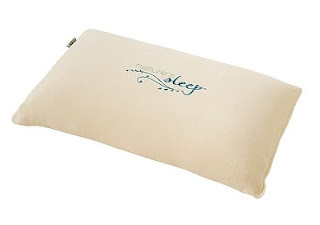 Thanks to Nature's Sleep for sponsoring this great giveaway, for one Vitex2 Memory Foam Pillow! Check out Cute-Ecakes review HERE! Win one for yourself in this easy giveaway! Simply complete the Rafflecopter form below for several chances to win! I share a bed with 2 standard poodles and a husband. Anything that makes my night's sleep better is worth it's weight in gold! All three of my kids take turn waking me up LOL....so I would say me. I am getting veeeeeery sleepy!! I am the one in my house that needs a good nights sleep! I have fibromyalgia, and I have chronic pain. So it is difficult for me to get comfortable. I would love to try this pillow to see if it could possibly help me! My husband has a herniated disc in his neck and needs this desperately. We just don't have the money to buy him one. It would truly be a blessing to him if I were to win this for him. Oh well, I don't have twitter, love my memory foam pillow. I really need this pillow. The bed is uncomfortable with my ruptured disc and the pillow is uncomfortable for my painful neck triggering migraines. I'm up and down ALL night long EVERY single night. Something has to be comfortable enough for me to sleep through the night. i do!! i have severe back issues!! i hurt really bad at night, so its hard to sleep. thanks for the chance to win this!! id love to have a whole bed made of memory foam! My Husband! He works seven days a week, 365 days a year, delivering the newspaper at 4:00 am every morning!! ME! I could use a good night's sleep... on a private island, just say'n ;) thanks for the opp! My husband would need this more than me. I need a good nights sleep but suffering from insomia for several weeks. I need all the help i can get. Alicia S.: I need the goodnight sleep in our house. Mom makes it all happen! I do - I have chronic migraines. I need a good night's sleep because I'm always sleeping on the couch instead of my bed! I need a comfy pillow for my goodnight sleep! Thanks for this giveaway! My teenage son could use a new pillow to get a good night sleep. me, me and me!!!! : ) Momma's never get enough sleep! I would have too say that I need a good night of sleep. New baby in the house....sleep would be so nice on new comfy pillow's! Thanks 4 the chance! I need a good night sleep. Between my husband that snores sometime and my five kids. I definatly need more sleep. I always need a good night sleep. Stress and random things wake me up so I feel like I get only a portion of the hours I know I did sleep. I definitely need a good nights sleep. I suffer from osteogenesis and osteoperosis and it is very hard for me to get comfortable enough to sleep well. My husband has a hard time sleeping, so if I won this it would go right to him. I am in serious need of a good nights sleep!!!! Me lol! I might sleep a straight four hours but after that I wake up every hour on the hour til I I just cant take it any more. Me, I can always use help getting a good nights sleep!